Hey, this is a big blog about my experience translating Epic Battle Fantasy 4 and Bullet Heaven 2, and how I’m trying to do things better in Epic Battle Fantasy 5. I asked for volunteers from my fans to translate and proofread, and a lot of people stepped forward. I couldn’t judge their skill at their first language, but I made sure they were at least fluent in English. My translation strategy was to turn all of the text strings in EBF4 into arrays of text strings, and dump them on Google Docs so that all the translators could work on them at the same time. “Word” would turn into ["Word","","","",""] and the translators would fill in the gaps. I also provided a lot of notes and instructions for the translators, and hung around in case they needed me. Once translated, the script was also shared publicly, so that anyone could provide feedback if they wanted to. This wasn’t very efficient, but it worked. The worst part was going through all of the game’s code, trying to find every tiny bit of text, copying it to a Google Docs file, and then later doing that whole process in reverse. It also means that adding a new language now would involve all of that work again. With EBF5, I’ve put all of the text in seperate files right from the beginning, and each file contains one language. The game’s code just loads the relevant text file depending on the options. This means that adding a new language requires almost no extra coding work: I can just give out the English files, they can be translated, and the game can load them as a new language. So that should save me a lot of work in the long term! • It turns out that most translated text ends up being a bit longer than the original, so I had to significantly increase the size of many text boxes. Lesson quickly learned. • Translating parts of sentences separately is a very bad idea, for example: “A ” + “fire/water/ice” + ” elemental attack!” This works well in English and a few other languages, but you never know when weird grammar rules might pop up. From now on I’m sticking to full sentences, even if it leads to a lot of redundancy, like typing out the full line for 10 different elements. One thing that went very well was, uh, Flash! Flash handles special characters and text related stuff very well. So I never had any problems putting weird non-English characters in my games. The default fonts seem to handle everything. So, in the end, was translating worth it? Well… kind of? It took me about a month to organise and implement EBF4′s translations, which also includes countless hours of work by the translators and proofreaders. The Steam sales for German (8%) and French (4%) are reasonably high, so from a financial perspective, those languages were worth doing, maybe even if I had to pay professionals instead of volunteers. But even though tons of Spanish and Portuguese speaking people played the free versions of EBF4, very few of them bought the game on Steam (less than 1% of Steam sales each), so if I was translating just for money, I wouldn’t have done those languages. 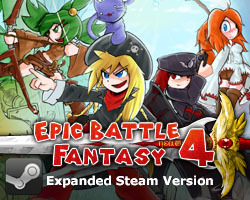 EBF4 was overall very successful on Steam, with around 100K sales in total – so 8% more sales is a lot in the end (well, I’m sure a lot of Germans speak English, and may have bought the game without a translation, but whatever). My other game, Bullet Heaven 2, on the other hand, was not so successful. The game wasn’t a flop – but it’s not far from it. Even though it had much less text to translate, I think translating that game was a waste of time – it just wasn’t worth the extra work. And if I had paid professional translators, I would have lost a LOT of money on it. So I think that’s what it all comes down to for me. If I have a lot of fans in some region, and they want to volunteer to translate EBF5, I’m perfectly happy to work with them and make it happen so that more people can enjoy the game. But I wouldn’t bet on the translations to be worth it financially if I had to pay professionals. I guess I just don’t like taking too many risks. It’s also not particularly fun to program my games to support multiple languages. Anyway, I’m almost ready to start translating. I’ll start doing research and asking for volunteers soon-ish. German, French, Spanish, and Portuguese are coming back, and the new languages I’m strongly considering are Chinese, Russian, Polish and Vietnamese. Feel free to suggest others, but I think those are the most likely. Of course, I can always add more languages after the game is released, as the new infrastructure makes that much easier than in previous games. I’m interested to hear what you all think. tl;dr: I translate for the fans, as it’s probably not worth translating a text-heavy indie RPG for financial gain, except maybe to German. This entry was posted in Bullet Heaven 2, Epic Battle Fantasy 4, Epic Battle Fantasy 5, Thoughts and Opinions on August 14, 2018 by Matt Roszak. I am German, but i really must say i prefer the English version of the game in any case. Nice to hear, eager to participate in translation. Hope, organizing the volunteers won’t be too troublesome. I hope you will pick a lot of your fans to help you. We all would love to help you finish this new game from one of the best indie RPG game series. About myself i can translate to French since i’m French. (Always better to my mind). And i would love helping in this serie which is my favorite one in Flash Games. It is better to let people translate from their foreign language to their own / native language. But that should be clear. (does this work in english, this “clear”)? I’m German, my English is not the best, but I can correct a translated text which may sound odd or have grammatical mistakes in it. Welp…the more – the merrier, eh? What you said may be true, but may also be untrue. Brazilian people who play games since the 90′s sure ended up getting used to have only “English” as a language option. I guess doing it never hurts… Also this game shouldn’t be aimed just for fans from the older series, but for some new ones, and having the “Portuguese” option is a way to make these people a little more interested in it. As a German who prefers English text translations are obsolete which I’m probably pretty alone with. To be honest, within my friends circle nobody really knows decent enough English to converse with someone. This underlines your assumption about Germans not knowing English well enough to read through the texts. Although worth mentioning is, EBF is simple enough to not required to read directions or objectives to know where to head next. Well, I’m in the same boat as you except that almost everyone I know prefers english translations/voiceovers over german ones. I don’t think I can say much, because my first language is English and I only know a little bit of Spanish from Spanish class. Never really paid much attention to it, though. How about romanian ? Sure , Romania isn’t the most known country – hands down , the Transilvania and Dracula you know aren’t the ones I’m talking about – but you still have fans there . Translating the game in romanian shouldn’t be hard at all . Pretty sure I will be able to help if selected for romanian . To ask for a romanian language is more than ridiculous. He already claimed that it took a lot of time to translate it to portuguese and there are only less than 1% from portuguese speaking countries that buy his games on steam. Romania is probably below 0.0001% so it would more than a waste of time to translate it to a language which is to 99% only spoken in Romania. This is not meant as hate, but you shouldnt ask for the translation into a “small” language. All I said was that I could translate it in romanian if needed . I am extremely fluent in English and my first language is French. It would be an honor to translate your games. I just need to know when, where and how I must translate. If would want help, just ask me, I would be pleased. Yeah, from what I’ve seen, Polish usually uses English names in many games. I think the tendency is for more minor/indie productions to translate only dialogue, descriptions and menu to Polish, but leave specific names (characters, location, sometimes even unique items and abilities) in English. While major games will usually get a complete translation of everything; much to the ridicule by that part of playerbase that knows English well, because of that “sounds silly at worst” part (though sometimes it is more due to dubbing than the raw text itself). A tendency which probably holds true for not only Polish translations, I guess. Anyway, I am set on doing the Polish translation of EBF5 since day one. So you can count on me. I know my Polish well, and I know my English well. I thought about whether to translate equip names etc. While they will probably sound “kinda weird at best, and silly at worst, and there is nothing that can be done about it” I came to the conclusion that silly sounding names wouldn’t really feel that out of place and jarring in context of the EBF series anyway because of the series being kinda silly and comical in the first place. That was interesting to read. I’m Brazilian, and it’s really good that Steam separates PT-PT from PT-BR, because they have a lot of differences. Usually I play games in PT-BR, but sometimes I also play in English. 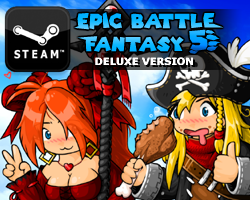 I’d be very happy to translate EBF5! I know you didn’t mention it but how about Japanese ? I think it’s well worth trying it since this game is like how JRPG used to be. Not sure if I have enough Japanese fans to make it happen, but I’d like to try after release maybe. Hi Matt, you mentioned that BH2 wasn’t much successful. Does it mean you’ll be only focusing on EBF only from now and then? As for me, I started from steam BH2 since I was (and still am) interested in bullet hell games, and after playing for a few dozens of hours I saw two RPGs from the same developer and with the same characters. I decided to give them a try and totally didn’t regret that, gonna buy EBF5 the day it releases. But I’d love to play BH3 if it ever comes out as BH2 provided some unique and great experience for me. Yeah, I don’t think I’ll make another game similar to BH2. Maybe I’ll make some different style of shooter someday. I’m not volunteering, I just wanted to say how awesome you are Matt. You’re very awesome. Well, if you’d ask me if I’d like to play on German or English I’d answer “both”. My personal opinion, you can’t transport jokes or phrases directly into the other language, at the same rate some jokes can’t be directly translated to the other language because they simply don’t exist or would look odd. I give you an example of poor English in Germany, well known might be the word “become”, some in English poorly skilled german might translate it into “bekommen” but actually this german word would mean “get”(like “get a gift”) in English. I just want to point out that the whole message can’t be directly translated and the humorous part could get lost if the translation is bad(or wrong, even if unlikely). But to come back to the point when I said I’d play with “both”. A side reason might be to see the coin from both sides(idk right now how you’d better or correctly phrase it), be it for being curious or any other reason, but the main reason for me is, that I often prefer to talk about in-game stuff with others or use wikis. As somebody who got used to only his native language but not the English original descriptions they might get confused when it’s about searching the right translation without knowing them. Also wiki sides do not always offer the same amount of content as it would do in English. So the simple reason for prefering to play on English language is to know “what people are actually talking about”. A minor 3rd reason is to keep fresh at my English skills or even learn new stuff. So I would play the game on German every now and then, but I bet I’d mainly play it in the original language, for simplicity using external sources like a wiki or communication. I appreciate your effort on offering the German language, though I’m one of those who doesn’t really rely on that. I’d imagine not on the outset, but have you ever considered more absurd language options. like esperanto, scots, klingon, or pirate talk, like the one from minecraft. also just thought i’d mention, that Quebecois french, (Quebec french) is different than France french. I’m talking about the game as a whole. I am Brazilian and I love this game, but I believe that if the game did not have translation I and many other people would not have known ebf4, so in my opinion the translation of games is very important! Please add the Russian language to the game. I play your great game, but unfortunately I do not understand English, like most other buyers of this game. Might I suggest Bosnian-Croatian-Serbian? It covers an additional 20+ million people and I’d be happy to volunteer! Fluent command of English as well as BCS! Oh my, the game will be translated to Vietnamese!! Sweet! If you’re looking for a volunteer to translate the game into Vietnamese then I want to take a place in the translating team too! first of all – I see your point. I mean, if I had to choose between playing the German or the English version, I’d gladly play it in English, but judging from the experiences I got from some of the people I met, many would prefer German just because their English isn’t that good. Thus, since Uni is on break for me until October and I’ve been playing games so much already that doing something useful is more and more sounding like a better option for spending my time, I wanted to volunteer for translating EBF5 into German or at least, if there are already too many applicants, do some proofreading. I could help translating EBF 5 to Russian since i am pretty fluent in English and ahuge fan of your series! I’m a Chinese fan of EBF.About copyright problem in China,I’d like to introduce something. In several years ago,pirating are do popular in China,There are still some pirating game download website now.But players’ concept had changed little by little in recent years.Now,the number of Chinese users is the NO.1 in steam.Although China has huge population base,we can still see the progress of Chinese players’ copyright awareness. (1).Pirate Only.Now people who has this attitude are rare,and generally,this kind of people would be looked down upon by others. (2).Fare Adjustment.If a steam game has pirate,they would choose to play pirate first,and buy steam version later.We call this behavior as Fare Adjustment.most of them may feel 2 hour test are too short to judge a game.Also, small part of them wants to play game earlier,pay later in order to waiting for discount. But (2) and (3) are not always would pay for games they played.some game that they thoght “Unworthy” wouldn’t be paid.But If they finish a game,most of them would pay-unless too expensive. (4).Steam only.This part of players will not choose pirate always.But the number of them are less(more than(1),at least).This kind of players mostly are fans of some company. As my feeling in Chinese forum,the rate of those kings are 1:7:8:2.This rate may has deviation,but (2)and(3)are main part,it’s affirmative. Anyway,Chinese players’ ability and desire of buying are rising step by step.I’m very happy to see EBF5 with offical Chinese version . :stars: After it’s published,I will buy it and do some propagation in the forum I often go to.Finally,May everything be fine for you! we can see this website though,but it’s very hard to find and to understand. Since I don’t see any other offering themselves to translate to Spanish in these comments I’ll step forward and say that my native language is Spanish and my English is at least good enough to play games that lack of translations. Long story short, I’m a volunteer to translate from English to Spanish. So does that mean the official game won’t be released until the translations are complete? I speak germann and i was very happy taht your games become germann because at this time my english was pretty bad. So tahnk your for taht work. I take part of Early Access of Secrets of Grindea and they did translations in quite efficient way – you can get translations from Steam Workshop. There are translation tools available, so any volunteer can translate the game themselves and upload translation via tools to Steam Workshop, which is also integrated in game. The game automatically detects your language and downloads a translation (or asks which one to fetch if there are more than one for your language). Since it’s workshop, everyone is able to comment and rate the translations and ratings are seen in-game, so it’s possible to determine translation quality based on popularity. Well, this sounds like complex system and might take some time to implement (probably isn’t that hard tho) and also would work only for Steam version, but in long term it’s really good for fan translations of games with lots of text. After you implement it, you can forget and just let fans create and upload translations for literally any language without any additional work from game creator’s side. Chinsese guys need some magical ways to visit google doc if they live in China mainland. Make sure they arent trapped in this difficulty. First of all just want to say that I have loved all your work thus far and your games made me get into RPGs . If possible I would want to translate this as well, but possibly not to add it as a language to your game. That’s because I would want to translate it to Estonian something that only about a million people speak. I am possibly the best English speaker in my small city of 15k people, however my grammar and translating could use some improvement. That’s why I would like to try and translate this just for self improvement and as something I could do with my free time. I’m not sure if my country really has any fans for your work but I sure do know that I have made some . Tl:dr Would like to do translating for fun. What about italian? I don’t know the sales of your games in my country, neither how many people play them, but if you are interested in traslating EBF5 to my language anyway, I can do it. I know italian, english and EBF saga enough to make a decent translation and, possibly, to maintain puns (or, at least, to try to localize them). What I can say, for sure, is that italian people tend to be extremely conservative about our language and its use in media. Anything not subbed or dubbed has a low or zero diffusion, it’s a problem that derives from a very bad school system. Dear Matt, I’ve been your fan for quite some time and I enjoy everything about your games. I really look forward to offering some help this time. I can work on the Chinese translation part. I’m pretty confident in both languages. Please include me in the volunteers if you can bother to send me a copy of text strings as it’s not so convenient to visit google here. It’s a honor to help people, especially someone awesome as you! Anyway, love your content, good luck and stay strong! Hey, at least we won’t have to worry about Chinese bootleggers putting 7 Grand Dad in the game. I will buy this game immediately when it release. So please add Chinese language as soon as possible. Matt I can translate it to russian with pleasure if you want . YouTube Analytics have informed me that a surprising number of EBF fans are located in Vietnam, so I think there’s a good chance translating to Vietnamese would work out. Also you should take one out of Minecraft’s playbook and translate the whole game into Pirate Speak. I’d volunteer to translate it into Dutch, but there are so few people who speak it and are fans of EBF it’d be pointless. So me with romanian . i appreciate greatly that you translate to so many language (and especially french as its my native language) for the fans. A Dutch translation would be cool. Dutch is one of the most underestimated languages. Though you will need a Flemish version and a Netherlands Dutch version. First off, the moment I discovered EBF I fell in love with it. I’m from germany and have about 20 years of international online gaming backing up my english, besides that I also have previously assisted in translating another game before which was quite difficult as they wanted every word translated individually. So I have to say your decision to have entire lines translated as a whole is a very good move as that allows the translator to actually see the context and can properly translate. Even better would be text blocks that belong together especially when a line refers to something in a previous line indirectly. As has been mentioned here before, certain things are hard to translate, especially sayings or jokes. (Example: English: Another one bites the dust. – German: Und wieder beisst einer ins Grass – German word by word translation “Noch einer beisst den Staub”) with the word by word translation making absolutly no sense in german. I would gladly volunteer to help with the translation as I know it is not an easy job, and I usually stay clear of german translations in games myself as they usually tend to be rather poor. Im from Malaysia. I have heard that EBF going to be need of translator for it final release soon. Im one of huge fan of this series since 2009. Back then the game gives me inspiration to be a gamer on PC all around and as result this day: A translator. Im from Malaysia. The news regarding EBF needing translators for its final release had me interested. I am a huge fan of this series. The game is so interesting that it has inspired me to be involved in gaming, anime, and also translations. this fairly sounds good to bring the game to international level. I know languages could be marketing values, should the developer get it right into the hearts and minds of its fans. Well as a Malaysian, I can help with Bahasa Malaysia, it would do some challenge to localize the game. And im sure it will have internet viral power her in Malaysia due to our social media prowess. cant wait for the main release. the best way is to translate each paragraph or multiple paragraphs in its whole context, or in this case the whole coherent conversation or skit. you also need to think about that not all jokes or references works in other languages, mainly because of grammar but also since we dont have the same daily life. some one that plays english games will most likely get the joke and references but some one who dont know english at all will not. It was kinda funny. Iam german, and i played the flash versions all in english. When i got the game on stream, it was mostly because i liked it the last 2 times i played them (from start to end) for free and didn’t even start it up until much later. I always was like “Hmmm, there is something different here. I kinda remember these lines different”. I just put it on the different style of cutscrene between 3 and 4 (ingame vs cardboard-cutout). I think i was 4 boss battles in that i even understood that the game was now in german. Which was strange, because i like english more (golden rule: always play the game / watch a show in it’s original if you can). But then i was to far in to change. Know my Pain. Yeah, at least it was fan-translated (aka good). This game is interesting. If you don’t mind I can lend you a hand to translate in Malay language. Can’t wait for more updates. Sad the French summer vacation is ending, my kids (and I) were eager to start the French translation together. We are still willing to help, even if at a slower pace than intended. I’m curious about how you want us to translate jokes : some will work in both languages, but some word play may not be translatable. Do we come up with alternative jokes that we have to explain to you ? Not sure if you know, but some extra jokes were added in French EBF4. For example, the mage dog was translated as magichien, a portmanteau of magic and dog that sounds like magician with your mouth full of cake. Gave me a good laugh. We tried to invent new jokes and puns for the translations sometimes, yeah. wtf some fans did pirate translation into russiana and now you are not hiring them for official TL?? Hello. Are there any plans for an Italian translation? I’d like to help in making one, if possible. Hey there! I’m a spanish native and would LOVE to help you translate your games, EBF is one of my favorite flash game sagas (bought EBF4 on steam right away). I’ve also got some experience in translating games already so there’s that too! I too speak Chinese and would be willing to help. However, Mark specifically stated that he doesn’t plan to support Chinese translations since there’s already a bunch of unofficial translations. I don’t follow Chinese translated games but I wouldn’t be surprised if that were true. Chinese players are becoming more and more widespread (some have said they’re the only reason why PUBG is still currently #1 on Steam’s player charts). So I realize it’s a bit late but I just thought of this: would it make sense to do string formatting (“A %0 attack!”, “water”) instead of partial statements (“A “, “water”, ” attack!”)? I’m Brazilian and my English can not be the best, but I’d be glad to try!